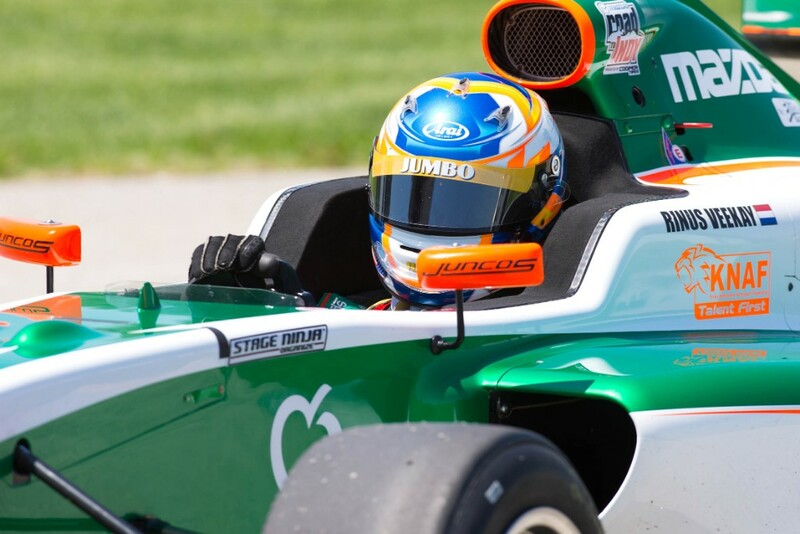 Mixed feelings, but mostly disappointment for KNAF Talent First car racing talent Rinus VeeKay after the third round of the Pro Mazda Championship Presented by Cooper Tires at the Indianapolis Grand Prix Circuit. In the first race of the weekend the 17-year-old driver from Hoofddorp in the Netherlands claimed a hard fought third position and once again showed his racecraft. But in the second race VeeKay was out of the race even before he crossed the starting line after one of the competitors in front of him made a reckless move through the field. VeeKay was left with nowhere to go, crashed into a car and had to give up with a broken front wheel and suspension damage. The young Dutchman, in second position in the championship, lost a fair chance of scoring valuable points in the title race. In the month of May, Indianapolis is the center point of motorsport in America, and especially for the Pro Mazda Championship Presented by Cooper Tires. At the end of this month Lucas Oil Raceway, the 0.6-mile oval of the world famous 2.5-mile Indy oval track, will host a round of this Road to Indy category. But first the drivers had round three of the championship at the also challenging Indianapolis Grand Prix Circuit, the 2.439-mile 14-turn road course that also uses a part of the famous Indy 500 oval track. From the very first minutes in practice, KNAF Talent First car racing talent Rinus VeeKay was one of the quickest drivers at the Grand Prix Circuit and scored a great second qualifying position in the competitive field. In the second qualifying, the top of the field was even closer together and although the 17-year-old driver from Hoofddorp in the Netherlands fell only 0.177 seconds short of the pole position, he was the number five qualifier, also his starting position for race number two. The first race of the weekend was a real thriller where VeeKay claimed a hard-fought third position. The KTF driver started from second position on the grid, but was leading the field after the first corner. Just at the moment VeeKay was creating a gap to the rest of the field, the safety car was deployed and his lead was gone. Because his Juncos Racing car was lacking top speed, VeeKay was passed at the restart by the car in his slipstream, immediately regained the lead, but was then passed again when his pursuer also make maximum use of his slipstream. After a second safety car period, VeeKay lost another position at the restart and was third. The young Dutchman fought his way back to the two leading drivers, but couldn’t take advantage of their slipstream and finished third, one second short of the winner. With only the sixth quickest lap time of all drivers in the race, but finishing on the podium for the third time this season, VeeKay once again proved his racecraft. After the race the team found the reason for the lack of top speed in a blocked shaft in the gearbox. “I was lucky that I could finish the race with that gearbox problem. But after leading most of the race, the third spot is not what you are aiming for. But this was the max with the speed we had. But now that the problem with the top speed is solved, I can only do better in the second race,” said a not completely satisfied VeeKay. But all the good prospects were gone immediately, as even before VeeKay could cross the starting line, his Juncos Racing car stopped with a broken front wheel after a reckless maneuver from one of the other competitors. At the start one of the competitors in front of him suddenly changed his direction and hit another car. That car veered to the side where VeeKay’s car was and the young Dutchman was left with nowhere to go. The KTF driver jumped over the rear wheel of the crashing car and came to a halt near the wall with a broken front wheel and damaged suspension. A fair chance of scoring valuable points for the championship was gone. The young driver from Hoofddorp is in second position in the points standing after six races, 22 points short of the leader. “I braked and tried to avoid the car, but there was nowhere to go. It’s a pity because I’m here to race and not to fly. The flying I do between Europe and America is more than enough,” said VeeKay, proving that although very disappointed, he hadn’t lost his sense of humor. Fortunately for all drivers their worst score of the season will not count for the championship, but VeeKay has now used this escape with the ‘did not finish’ at Indy.